1. 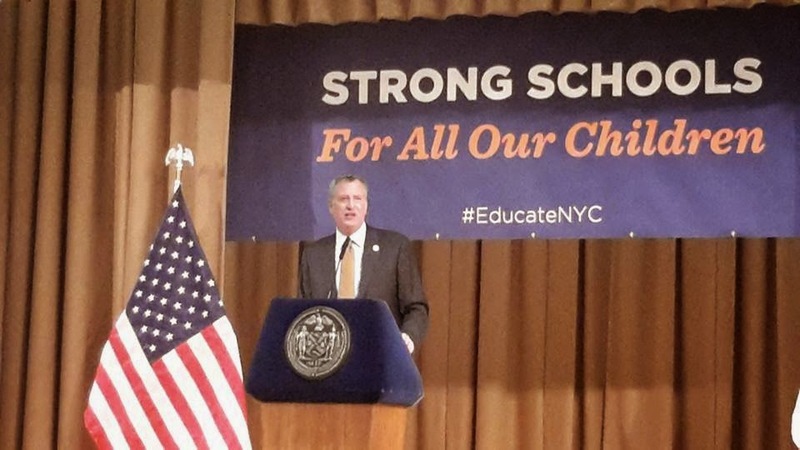 This morning, Bill de Blasio gave an eloquent speech on his solution for struggling schools. The list of 93 schools to get additional supports is here. The primary reform offered, extended instructional time, has been tried before many times, with negligible impact. It was one of the options that the feds allowed and that many NYC schools adopted as part of their “School Improvement grant” program -- with disappointing results. As Gene Glass, noted education researcher has put it, “Within reason, the productivity of the schools is not a matter of the time allocated to them. Rather it is a matter of how they use the time they already have.” Only if the extra time is devoted to something different – like small group instruction or tutoring – will this likely help. When I looked at the class sizes last year at Boys and Girls HS in Brooklyn, another school on the list that has struggled for years, I was horrified to see many classes at 34, and a student/teacher ratio (including special ed classes) extremely high at 20.1. The other policy option that will be offered by the Mayor, community schools –i.e. adding social and medical services – may help, but many of the struggling schools on the list are already so overcrowded that it’s not clear where the space for these programs will be. Already many of these schools are providing mandated services to their special needs students in hallways and in closets. Without a real plan to alleviate overcrowding and reduce class size, it’s not clear that these schools will be given a significant chance to improve. . There is also is a substantial overlap between this list of schools and the 75 schools that the DOE promised last year to reduce class size as part of their state-funded Contracts for Excellence plan. Unfortunately, we found that despite $600M in annual C4E funds that could have been used for this purpose, no extra funding to reduce class size was provided these schools, none of them made their class size targets, and in about half of them, class sizes actually increased. Bill de Blasio also spoke a lot in his speech about treating parents as partners. However, if he refuses to listen to what most parents think would most help their school improve --lowering class size, for the last eight years the top parent priority on the DOE’s own surveys -- it’s not clear what this partnership really means. Where is the money for a community schools program coming from? Lower class sizes would help improve the public school system. Do you really think any of these politicians want to help? The goal at the moment is to destroy it and to privatize education so the politicians and their friends can make money off of each student. You're living in a dream if you think anyone in power really wants to improve it. They want to destroy and rebuild just like they knock down neighborhoods to build a mall.